What is Term Insurance with a Return of Premium? Buy Term Life Insurance and get every penny back with Return of Premium Term Life! Term Life insurance is the known as the purest form of Life Insurance and its the least expensive way to get the most coverage. There are still those who just can’t see themselves spending all that money and getting nothing back. Well, the good thing is that if no one gets anything back from Term Life Insurance, its because you lived through the term of the policy. Term Life Insurance for families and individuals is a lot like car insurance. You pay year after year for auto insurance and never expect anything back. You have it just in case something happens, and you hope it never does. For a select few, Return of Premium Term Life can make good financial sense. Take for example an individual that is very young and healthy who is contemplating buying a Whole Life policy that has been presented to them by a local agent. To a 25 year single male who just started his career, seeing an illustration that shows the Cash or Surrender Value growing over time is very attractive. The truth is that most individuals in this situation are not buying enough death benefit to do much good. $100,000 may look like a lot and cost a modest amount, but if this man (Client X) has two kids and a mortgage, $100,000 won’t do much good for the first 20 years. He would need a significant amount more to raise the children, pay off the house and provide an income for the wife who is a homemaker who cares for the children. We can assume this newly wed 25 year old father of two will easily need $500,000 for the next 20 to 30 years. We compared the cost of a 30 year $500,000 Return of Premium Term Life with a Level Term and Whole Life Policy for the same 25 year old male. Here’s what we found. Whole Life Cost per year $4,155 The Guaranteed Cash Value ( @4% interest) of the Whole Life policy would be $132,210 in 30 years, and the policy holder would have paid in $124,650. 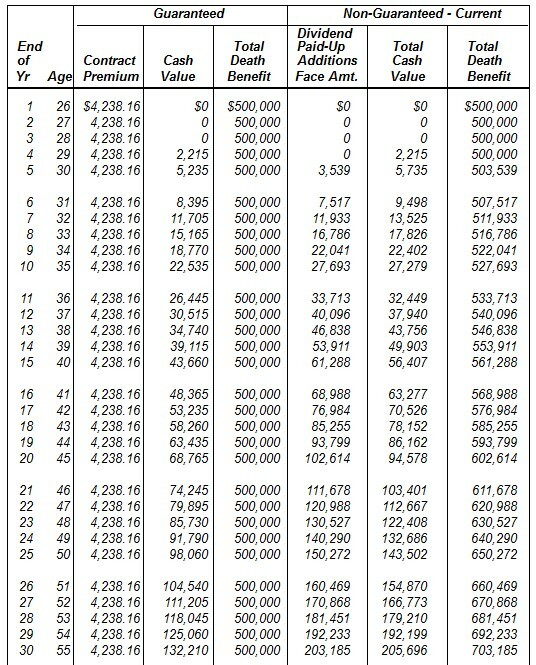 Return of Premium Cost per year $ 520 The Return of Premium Term Life policy would have cost $15,600 and after the 30 years he would get back $15,600. Level Term Cost per year $ 325 The Level Term Life policy would cost $9,750 and would get $0 back. If Client X purchases a Return of Premium Term Life policy, the rate of return realized at the end of the 30 years on the extra $195 more paid than if he purchased Level Term is 6.22%. So by getting all his premiums back that he paid over the years, he not only was insured for thirty years, but he earned 6.22% on the additional premium which is more than most any investment with a fixed rate of return guarantees. If Client X purchases a Return of Premium Term Life policy instead of a Whole Life policy then they would have been insured for the full $500,000 for the duration of 30 years, paid $15,600 in premiums, and saved $116,610 in premiums. Take the difference of what was saved and invest conservatively earning an average over 30 years of 4%. The end result would be $212,081 less the $15,600 spent on insurance and the gain is $196,481. If the entire amount was spent toward a Whole Life policy earning a guarantee of 4%, it would only be a gain of $7,560 ($132,210-$124,650) which is the ending Cash Value minus the total premiums that were paid in over 30 years .Compare the difference below. Both are based on 4% . Premiums paid for the life insurance and contributions toward the investment were calculated using monthly contributions. There are slight differences due to rounding-illustration reflects an average Whole Life policy with dividends added to the death benefit. Term Life Insurance that has an ROP (Return of Premium) feature either as a product by itself or as a rider, meaning that it is added to the Base Level Term policy, usually have a sliding scale of how much you get back based on when you cancel the policy. If you keep the policy for the full “Term” of the policy, it would be 100%, but if you need or want to cancel it sooner, the insurance company will give you a prorated amount based on when it’s cancelled. We’ll use our Client X as the example. For what ever reason, he decides that after the 20th year, he no longer needs the coverage. If he had the same company that I do (looking at my own policy) he would get back 62% of what he paid in. The return of premium in the first few years is minimal and actually $0.00 for the first 3-5 years. If you really aren’t sure you’ll keep it for at least 10 years on a 30 year policy, don’t bother paying extra for a Return of Premium. At some time during the policy there will be a break even point that you’ll get back the extra you paid in instead of buying Level Term without the Return of Premium, so it’s a bit of a gamble. Our advise is to buy this product if you know you’ll keep it for the majority of the term. Most of the time if some one cancels mid term, it’s because the just don’t need it any more and their financial obligations have been satisfied, but what a waste especially if the policy holder was so young like our client X. In a sense, these policies actually build a cash value,and many times won’t even refer to it being a “Return of Premium”. It is a “Surrender” and since the policy has a cash value to it, when the initial term period ends, it can keep going by using the cash value accumulated to pay the premiums. CAUTION: Make sure you actively submit a request in writing to “Surrender” the policy effective immediately after the initial term is over. If you don’t, the “Continuation” feature of the policy will activate which will eat up that return of premium in a few years. If you are very ill, and may not live much longer, you might want to use the continuation feature because your beneficiary will get back a lot more than what you paid in. Mark your calendar, financial records, or what ever you have to do to get 100% back! The responsibility is yours, not the insurance company’s. If you would like more information and quotes for a Return of Premium Term Life policy, fill out the form on the left or give us a call at (614) 402-5160.